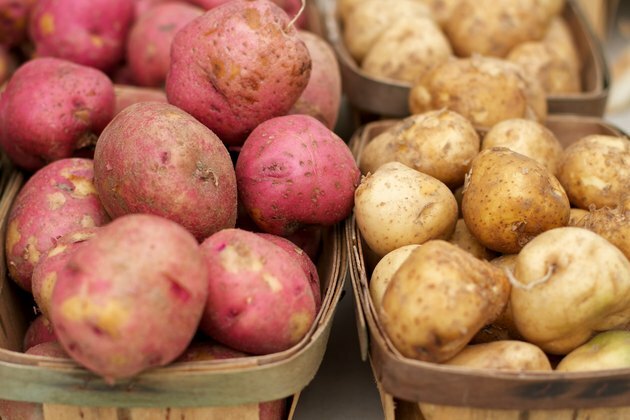 Are Red Potatoes Healthier Than White Potatoes? Choosing between red and white potatoes is often a matter of taste and the type of recipe being prepared. Both colors of potatoes offer a wealth of nutritional benefits, and the amounts of nutrients they contain are similar. Getting all the facts, however, can help you decide which color deserves a spot in your healthy eating plan. One medium-sized baked red potato contains 154 calories, about 34 grams of carbs and less than 1 gram of fat. A medium-sized baked white potato has 163 calories, about 36 grams of carbs and less than 1 gram of fat. The red potato supplies 3.1 grams of fiber, which is 12 percent of the 25 grams of fiber women should have each day and 8 percent of the 38 grams men require daily. The white potato contains slightly more fiber with 3.6 grams. Potatoes are a good source of potassium, and a medium-sized baked red potato contains 943 milligrams. That's 20 percent of the 4,700 milligrams of potassium that adults need each day for healthy muscles and a healthy heart. A medium-sized white potato supplies about the same with 941 milligrams. Either potato supplies about 14 percent of the iron men need each day and 6 percent of what women require. Iron is essential for red blood cell production. Red and white potatoes both deliver small amounts of zinc and phosphorus, too. Each potato supplies 21.8 milligrams of vitamin C, which is 29 percent of the 75 milligrams of vitamin C women need each day and about one-fourth of the 90 milligrams men require every day. Vitamin C helps keep your skin, teeth and gums healthy. The potatoes also supply about 17 percent of the niacin men should have each day and 19 percent of what women need daily. Niacin helps your body turn food into energy. The skin of red potatoes contains two to three times more antioxidant benefits than white potatoes, according to an article published in "Plant, Soil and Environment" in 2005. These antioxidants help neutralize free radicals, which are harmful compounds that can raise your risk of health conditions such as heart disease. The red color of the potatoes also means they contain anthocyanins, a specific type of antioxidant that can help lower low-density-lipoprotein cholesterol, as well as offer protection from free radicals. A baked red or white potato is a low-fat side dish to accompany grilled or roasted meat. Add diced cooked potatoes to taco or spinach salad to add texture and nutrition. Swap your usual meat and beans with cooked, chopped potatoes in tacos or burritos. Top sauteed potatoes with green chili, low-fat cheese and avocado for a filling vegetarian meal. Red and white potatoes can be used interchangeably in your favorite mashed or au gratin potato recipes, as well.